This entry was posted in News on March 23, 2017 . Students who want to pursue a career in software development can start signing up for this year’s Summer Internship at Roweb! Every year dozens of enthusiastic interns get to learn hands-on about topics that are taught in school and get the chance to put that knowledge into practice and build an application on their own, by the end of the internship program. They benefit of mentoring and help from our friendly senior experts and see what it’s like to work day-to-day in a software company. At the end of the program, all students receive a practice certificate and the most talented have a chance to join us as full-time employees, like many of our present colleagues started out. 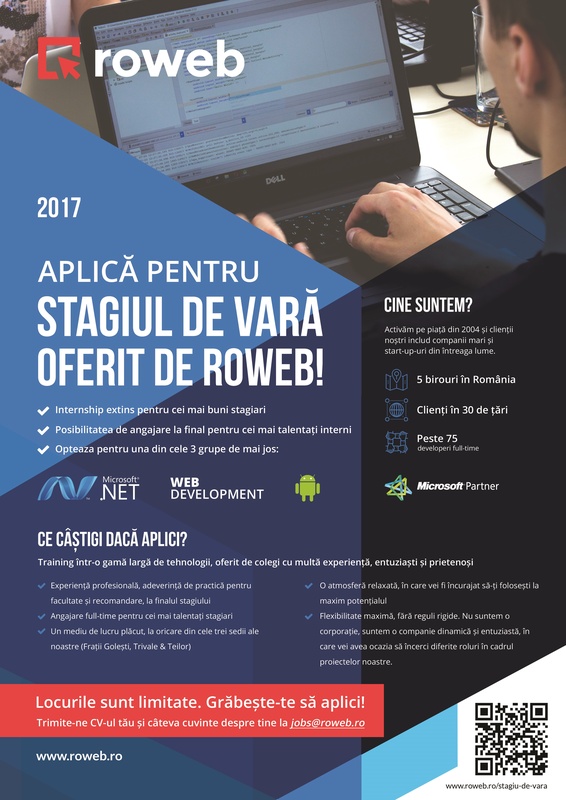 We’re receiving applications via email, at jobs@roweb.ro, or through the contact form on our dedicated page.